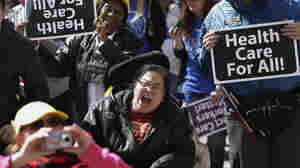 January 11, 2012  The real danger of the Bain story will not be manifest among Republicans this winter and spring. The real danger is that the story bobs back up in the summer and fall. January 9, 2012  Despite the lukewarm way most Republicans respond to Mitt Romney in the Granite State, no one challenger has emerged to capitalize on the dissatisfaction. January 9, 2012  Six women in Derry, N.H., talk with Morning Edition's Steve Inskeep about the economy, federal spending and who's the biggest flip-flopper in Tuesday's GOP primary. 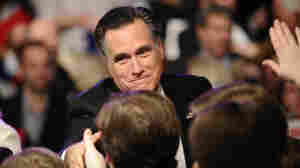 Can Mitt Romney Be Stopped? January 9, 2012  Candidates have gone into New Hampshire in the past with high expectations, only to be shot down, even if they won. 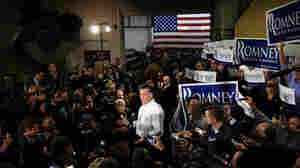 Mitt Romney knows the Granite State is set with traps for his nomination. 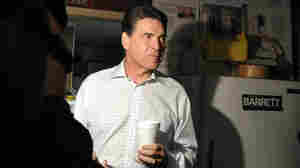 January 7, 2012  The crash-and-burn nature of the Texas governor's campaign was on display at his headquarters in Manchester. 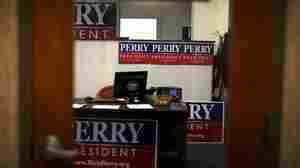 There was no one at the front desk, no volunteers making phone calls, just a landscape of largely empty offices and a stack of enormous Perry signs. 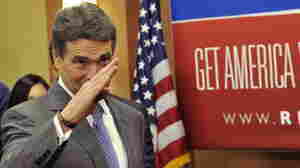 January 4, 2012  Though he said last night that he would go home to reassess his bid for the presidency — a signal that he might drop out of the race — Texas Gov. 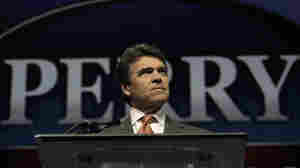 Rick Perry just tweeted that "the next leg of the marathon is the Palmetto State." 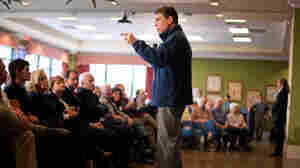 January 3, 2012  As Iowa Republicans head to the caucuses to have their say, we look at how the candidates stack up on the eve of the vote — and how previous winners (and losers) eventually fared.